-SG- I recently had the chance of looking at a collection of these lists, bound into a hard-back book by a former motor cycle dealer in New Zealand. No attempt was made to scan any of the contents in case of damage to the book’s binding but it is clear that, for several years during the thirties, if a new list was not printed, then a supplement of up to four pages was - covering changes to the content of the last full list printed. 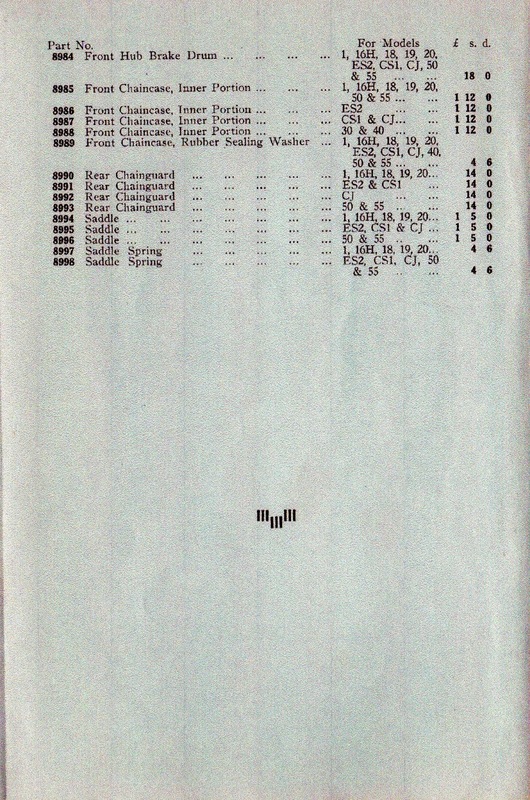 With one exception, all the main lists show the usual message on the front page of text ‘Covers models after (for example) 1930.’ It is not suggested that the following list of the book’s contents covers all the spares publications issued but it does seem to cover the majority. A question mark hangs over lists for the 350 models for the early part of the decade. If they existed, they are not in this collection. 1. Blue/Grey Cover. Covers 1931 models exc. CS1/ES2/22/CJ/JE. 2. Green Cover. Covers 1931 CS1/ES2/22 only. 3. Brown Cover. Covers 1932 models exc. cradle framed models and 350s. 4. Supplement. Covers 1933 variations exc. cradle framed models and 350s. 5. Red Cover. Covers 1932 CS1/ES2 and seemingly as an afterthought, models 30/40/CJ. 6. Supplement. Covers 1933 variations, for CS1 and ES2 models only. 7. Cream Cover. Appears to cover 1932 models 50/55. Not illustrated or dated. 8. Blue Cover. Covers all models for 1934 inc. 350s. 9. Supplement. Covers 1935 variations for all models. 10. Supplement. 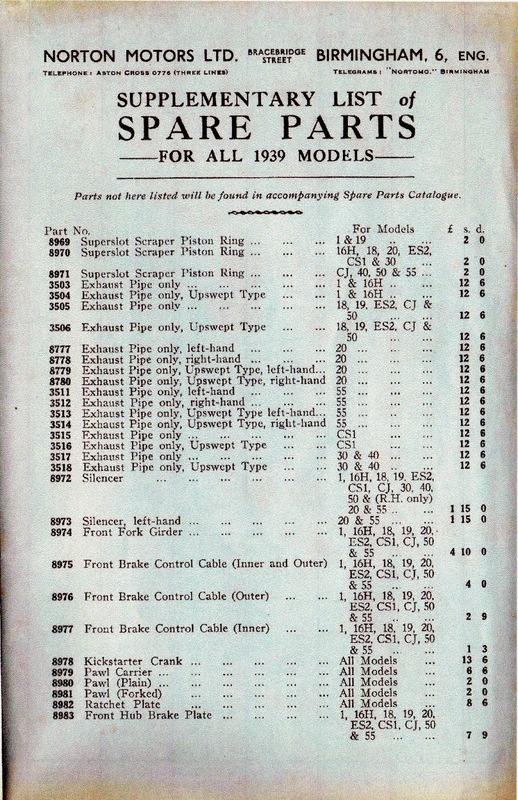 Covers 1936 variations for all models. 11. Green Cover. Covers all models for 1937. 12. Black cover. Incorrectly states that it covers all models for 1937 when in fact, it covers all models for 1938. 13. Supplement. Covers 1939 varations for all models. I have checked with the VMCC and the Norton Owners’ Club and only one supplement has come to light - the 1939 version. A scan of this has been provided by the NOC Librarian, Chris, for which many thanks.